The Canadian Food Guide has certainly changed quite a bit since the 1940s when it recommended a daily serving of potatoes and a weekly serving of liver, heart, or kidney. But since 1992, the guide has remained unaltered, so most Canadians are familiar with the 4 food group rainbow. However, while it may be well known, it’s not really the best guide to nutrition at this point. Instead, it may be better to think of food through the lens of nutrients. Carbohydrates come from plants and are generally found in grains. Food like bread, pasta, and rice are filled with carbs. Carbohydrates come in a few varieties, some are easily broken down by the body and can cause blood sugar spikes. Other, more complex carbs, take longer for the body to break down and absorb. Complex carbs are great. They provide your body (and brain!) with the high count of calories you need, but they also don’t cause spikes in insulin. Simple carbs should be avoided. Try to eat only whole grain varieties for bread, pasta, and rice. Other plant foods like fruits and veggies contain some carbs as well. Proteins are super important for all animals including humans. Our bodies use proteins to create our muscles, send messages, and even grow hair. Protein is dense with energy, and it’s thought that one of the reasons humans have such big brains and are so clever is we began eating cooked meat. All the energy from that meat gave us the extra resources to grow big brains and complex nervous systems. Because of this energy, a diet rich in protein is super important for children, pregnant and lactating women, and those recovering from an injury. There are also 10 essential proteins that humans need to live and cannot create themselves. That means the only way for us to get these necessary proteins is to consume them in our diet. 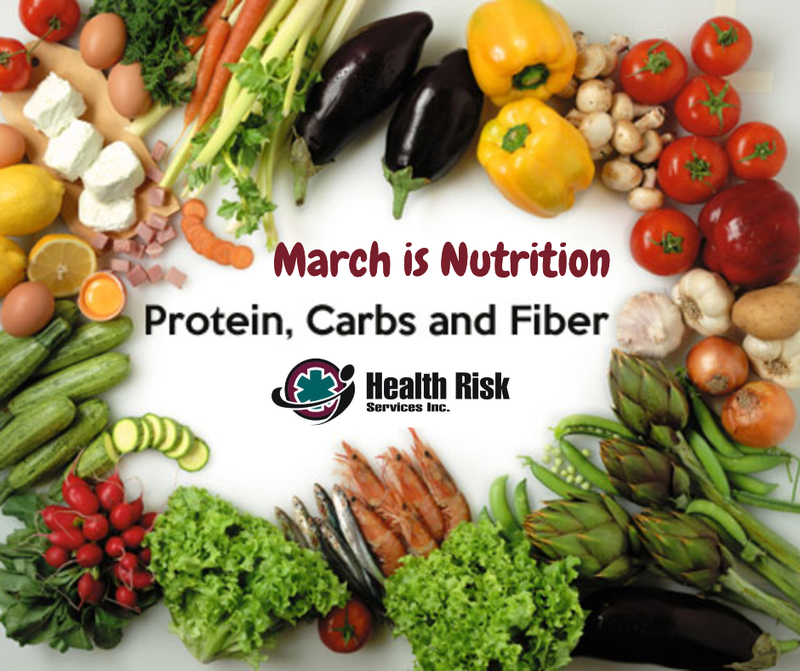 Sources of protein include meat, dairy, eggs, whole grains, soy products, and legumes. Fiber is actually a type of carbohydrate. Fiber mostly comes from cellulose, a long, complex carb that people (unlike cows and other herbivores) cannot digest.That’s okay though, because we don’t eat fiber for energy. Instead, fiber helps to keep everything in the digestive tract moving along properly. A diet high in fiber reduces your chance for colon cancer and helps to keep bowel movements regular. It slows down the digestion of other foods, preventing insulin spikes. A good rule of thumb for snacks is more than 2 grams of fiber for every 10 grams of sugar. Of course, the more fiber and the less sugar the better! Whole grains, fruits, and vegetables are all good sources for fiber. In this blog we covered three of the major classes of nutrients. Over the next couple weeks, we’ll talk about fats, essential fatty acids, and the difference between macro and micro nutrients. If you want to start eating better, the best thing to do is get informed! The experts at Health Risk are here to help Canadians live better, call us today!